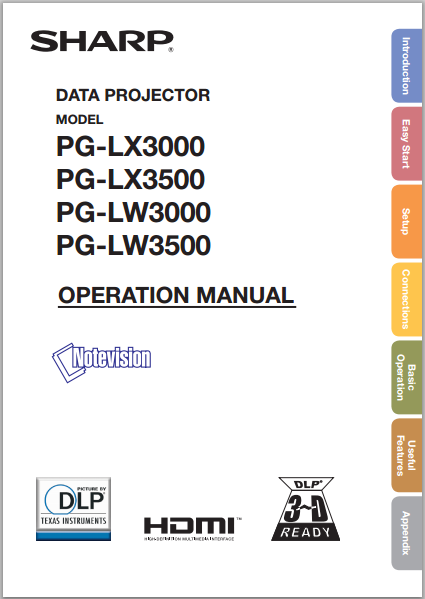 For owner of this projectors, now you can get the Sharp PG-LW3500 Operation Manual in pdf format. There is important information of this manual especially about setup, basic operation and troubleshooting guide. The Sharp PG-LW3500 user manual available in english language. It's devided into 7 section (included index). The manual contains reference information such as parts names and functions, inserting the batteries, setting up the projector, video setup, connecting the projector to other equipment, connecting the power cord, turning the projector on/off, operating with the remote control, using the spot function, freezing a moving image, using the menu screen, selecting the picture mode, and setting the overscan. Then about fan mode setting, system lock function, returning to the default settings, DHCP client setting, TCP/IP setting, restart network function, using 3D viewing mode, maintenance, removing and installing the lamp unit, resetting the lamp timer, and troubleshooting. No picture and no sound or projector does not start. Sound is heard but no picture appears (or picture is dark). Picture is blurred; noise appears. Data image is not centered. An unusual sound is occasionally heard from the cabinet. Maintenance indicator on the projector illuminates or blinks in red. The cooling fan becomes noisy. The remote control cannot be used.